In the past we’ve discussed how Moscow has some of the cheapest flights in all of Europe, in spite of the fact that it’s 1,000 miles farther than most other major cities, at least from North America. Today we’ll reconfirm that interesting little tidbit, but we’ll also throw St. Petersburg into the mix, which is a much nicer and more popular city for tourists. Known during Soviet times as Leningrad, St. Petersburg is actually the former capital of Russia, and it’s loaded with wonderful architecture and cultural treasures. Best of all, right now you can get flights from New York to St. Petersburg for only $550 round-trip, plus it’s actually cheaper by $10 to go to Moscow instead. You might consider visiting both of them because the train between the two is fast and reasonably cheap, but if you had to pick only one you’d be better off in St. Petersburg. Moscow is huge, strangely expensive, and not terribly friendly. 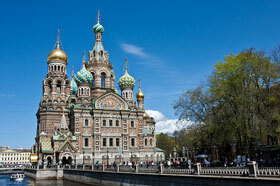 St. Petersburg is much smaller, much better looking, and more used to English-language tourists. Of course the main attraction for many is the Hermitage Museum and Winter Palace, which can be visited together on one ticket. It’s among the finest museums in the world, on par with the Louvre and the British Museum, but it’s only one of many fascinating things to do there. St. Petersburg is built with canals running through the center so there is always a body of water nearby to help frame a photo and add a bit of life to the scene. It’s also much more closely related to Finland and Sweden in that it takes on the more classical style of architecture instead of the bland Communist-era style that dominates most of Moscow. To reach St. Petersburg from other US cities you can fly from Washington DC round-trip for only $600 or from Los Angeles for only $820. However, since the cheaper Russian airlines don’t serve many other US cities you might be better off getting a cheap ticket on a domestic airline and flying yourself into one of the main hub cities that they serve. You should also be aware that you need a tourist visa to visit Russia, and they aren’t granted quickly in most cases so you’ll want to research and apply for that at least a few weeks before you plan to leave. St. Petersburg is a popular destination for cruise ships, and passengers of those don’t need a visa for a one-day visit if they don’t stay overnight, but tourists flying in for a special holiday will need to obtain a visa. Considering that visiting one of Russia’s largest cities is actually cheaper than flying to Paris or Rome for most people, going through the small visa headache is still very worthwhile.